Lubor On Tech: Why Do We Rename Products? Here it comes again - OpenText is phasing out the Vignette brand, IBM got rid of the Lotus brand for its WCM offering and Adobe keeps talking all about CEM while de-emphasising the Day and Omniture brands. As a result, the market is unhappy because these changes make no sense. Or do they? When acquiring another company, the buyer rarely does so to keep things the way there were. In many situations, the acquired company was in distress, its stock had dropped because of a revenue shortfall and there is usually a reason for that. The performance has to be addressed and the inevitable changes often include re-branding. The vendor also usually buys the company with the idea to complement existing offerings. The goal is to strengthen the overall portfolio by creating a more comprehensive solution set. Product A together with product B can do something that the individual products weren’t able to do. That is hard to convey to customers when the brands are completely different. How would OpenText get credibly across that Vignette and Artesia are well integrated and together part of a greater solution? Re-branding helps to get across that the combination is a new and better offering. In the end, it gets down to the vendor’s product brand strategy. There are two fundamental approaches called the house of brands and the branded house. The house of brands is a company that puts the respective product brands above the company brand and does not mind having several of them. General Motors is an example of such company. Its brands such as Cadillac, Pontiac, Chevrolet, Opel or Vauxhall are what the market sees and often customers don’t realize that they come from the same company. This is a fairly costly branding strategy since the vendor has to promote each brand individually and the brands don’t benefit from each other - the German customers buying an Opel don’t know that Vauxhall is one of the most popular car makes in the UK. The benefit of this strategy is, however, that the company can have multiple independent business that can maximize its performance. The branded house strategy is primarily focused on a single brand, usually the company’s name. BMW is a perfect example of such strategy. The benefit of this strategy is that the strengths of one product projects on other products. If you think that the BMW 325 is cool and sporty then the BMW X5 must be cool and sporty. This branding strategy is fairly efficient since it is very focused on a single brand. And as a result, that single brand is usually much stronger than the individual brands in the house of brands strategy. Just think about the difference in brand strength between BMW and Pontiac (Interbrand estimates BMW to be the 15th world’s most valuable brand while not a single GM brand made it to the top 100). The challenge is to convey the value proposition of the individual products - what’s the difference between the 320 and 325 and 525? Many software companies pursue the branded house strategy because they hope the branding strategy will support their product strategy which is usually based on a technology vision with a logical architecture. They want to project the benefits of one product to another and suggest how the products relate to each other. Only when they enter truly different markets - which usually doesn’t happen until they are well past the billion dollar mark - they start diversifying their branding into a house of brands. IBM is a good example of such strategy as their brands such as Tivoli, Rational, DB2 or Lotus really don’t relate to each other. But even the mighty Apple has chosen the branded house strategy for its main business with the collection of iBrands (iMac, iTunes, iPod, iPad, iPhone, etc.) - clearly to convey the integration and relationship between the products. Does anyone doubt that they relate? Changing a brand is never a trivial issue and the vendor usually weighs all the pros and cons. The major cons are the inevitable confusion that a name change causes and the cost of the transition. The benefit is the support of the overall product and corporate strategy as outlined above. Depending on the existing brand equity, the strategy might win over confusion which is usually only temporary. Unlike consumer software, enterprise software rarely enjoys much brand equity outside the circle of experts. And the experts are usually well capable of learning the new branding quickly - that’s why they are experts. In the end, the response to a brand change is an emotional issue because it is a change. And change is always emotional. But it is first and foremost a business decision and emotions have to give way to rationality. And when considering the context of the company’s strategy, re-branding is usually a very rational business decision. Actually, BMW is not as strict as you portray them to be. Guess who owns the Mini and Rolls Royce (cars) brand? One thing that makes me question the branding value, especially when we look at BMW example. all of the brand values of BMW transition into the Mini cooper and its not branded BMW. This makes me wonder if the move to slowly digest other brands brings value in the end or creates confusion in the market that later on brings insecurity. Mos of the people i talk to still call Adobe WEM Day Software, it has merits as the product is better assessed this way and you can tell its past. Another thing you stated is that "the response to a brand change is emotional" first thing is that all our dealing with brands are emotional based and less value based, second history carries also emotion and i think that the wish of the purchased to remove the history creates negative emotions rather then positive. In the long run it is the most logical thing to do as integration into the buying company offers a coherent solution and not a patchwork of solutions. But some time the integration will kill the product as the culture is a miss for most engineers and they leave thus rendering the product dead. So not all integrations are success. Hope ours is a great success as it seems to be at the moment. Thanks for your comment, Peter. I was indeed aware of the fact that BMW owns the Mini and Rolls Royce brands. It actually proves my point - since they are completely different, the value of the BMW brand does not project onto the Mini and RR brands. That happens when companies grow and diversify beyond their original core value proposition. But point taken - BMW is no longer a pure 'branded house' anymore. It seems software companies that make many acquisitions are criticized for frequent rebranding. As you point out Lubor there is business benefit to rebranding - so in some ways re-branding is a right and necessity earned by growth. To use your car brand analogy, GM dropped the Pontiac brand, and before that Oldsmobile, as they were shrinking. And when Toyota was a rising star they created the Lexus brand. BMY had to transform the acquired Mini brand to llose the association with poor quality while building on its 'hipness'. Thanks for your comments, Yuval. I've responded already to Peter about the BMW example. I completely agree with your comments on the difficulties of executing acquisitions. Acquisitions are not easy and branding is just one of the elements of integration that need to be thought through. There is always plenty of other issues that can go right or wrong. Thanks for your comment, Martin. Indeed, there is usually some thought and a strategy behind any brand evolution. Branding is also never static and the strategy itself may and will change overtime. Your examples are spot on. There is an advantage to the "house of brands" approach not mentioned yet: divestment is much easier. You can sell a whole product line w/o any damage to your other brands or the mother brand and esp. not the brand you sell. Happens in the Consumer Goods & Food Industry all the time. Sometimes even mandated by the Trade Commission (see for example http://en.wikipedia.org/wiki/Procter_%26_Gamble). Also, a brand can better survive consecutive mergers that way (see for example Milka - http://en.wikipedia.org/wiki/Milka) and the owning company can more easily position competing products in the same segment. Excellent point on the divestment and subsequent mergers, Peter. Thanks! Apropos emotions. Isn't that what successful brands are all about? So it's not the emotions triggered by a re-branding change ... it's the positive emotions associated to a brand that trigger a buying signal which are easily destroyed by a "rational" re-branding exercise. "A feature can always be matched. A claim can always be mimicked. But an emotional sweet spot is something your brand can occupy all by itself. " While I understand your point about bringing the brands under the house brand umbrella, I think that you examples are a bit misleading. 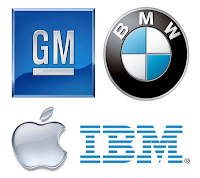 The Apple, BMW and GM Brands are products that they developed and not products that they acquired. In those cases it makes sense to have the branding as consistent with the parent brand. The issue that I see with for example the Vignette and Artesia re-branding is that there is an existing community that knows this name. Granted the communities may be small and the original companies may have financial issues but the customers and analysts know these names. I think that a more appropriate comparison would be IBM. When they acquire companies they slap the IBM name in front and call it a day. Yes I know that there are always exceptions to this, but if I am looking for their Maximo product I can find it under IBM Maximo even though it was purchased by IBM 5 years ago. Given the pace of acquisitions by Open Text I think that the re-branding exercise creates market confusion as opposed to a sense of calm and stability. Great Post ! I think re-branding works differently especially in software industry. Re-banding is either to kill the competition or enhance their offerings. And I am more inclined towards branded house strategy which makes more sense for provided expanded solution. Thanks for your comment, Shishank!